Who is to blame? Fisheries are complex systems, so numerous factors like human population growth, climate change, and changing lake chemistry come into play. But as our recent article in Ecology and Society argues, there’s another culprit: Joseph Kony, the still-at-large leader of the Lord’s Resistance Army (LRA) and, as a result of Kony 2012, the poster warlord of the 21st century. You can blame Joseph Kony for many bad things. That this also lands at his feet explains a lot about the mysterious ways in which coupled natural and human systems (CNH) work—and why we need to think about conflict dynamics when thinking about fisheries management. Coupled natural and human systems are situations in which human systems—social, economic, and political—are connected with natural systems—like lake ecosystems—in complex and reciprocal ways. In this case, changes in the human system wrought by armed conflict and migration resulted in increased fishing pressure along the lakeshore. Conflict between the Ugandan government and the Lord’s Resistance Army (LRA) began in the mid-1980s. It emerged in the context of an earlier conflict between the remnants of the recently ousted military junta, then called the Uganda People’s Defence Army (UPDA), composed largely of ethnic Acholis, and the newly established National Resistance Army (NRA) government, led by Yoweri Museveni, Uganda’s current president. Centered in the northern Ugandan districts of Gulu, Kitgum, and Pader, the fighting involved large-scale attacks against Acholi communities—and had absolutely nothing to do with fish. Unlike leaders of previous Acholi-dominated rebellions, Kony had secured external support from the Sudanese government, in the form of safe havens and arms. Freed from dependence on the local Acholi population for material support, but still requiring combatants, the LRA became increasingly abusive to civilians and began resorting to kidnapping children to staff its army and provide logistical support. Millions fled or were relocated to “protected villages,” camps for internally displaced persons (IDP) where the government could ostensibly provide greater protection from LRA attacks. In 1997, there were 532,000 Ugandans living in IDP camps. By 2006, those ranks had swelled to almost two million. Eighty percent of official IDP camp dwellers were women or children, and the men in camps were often elderly. Young men, by and large, sought employment in cities and along the lakeshore, which had been spared much of the worst violence of the war. The lake itself, and the employment options to be found there, were major draws for displaced persons from the north and for southerners facing increased labor market competition from displaced persons in southern Uganda’s more urban centers. In contrast to land, which is a closed access resource, the lake itself is open access, with no formal limitations on who can fish. This displacement corresponded with a 43 percent increase in fishing effort in the lake and a catch that more than tripled between 2000 and 2006 (see Fig. 1). 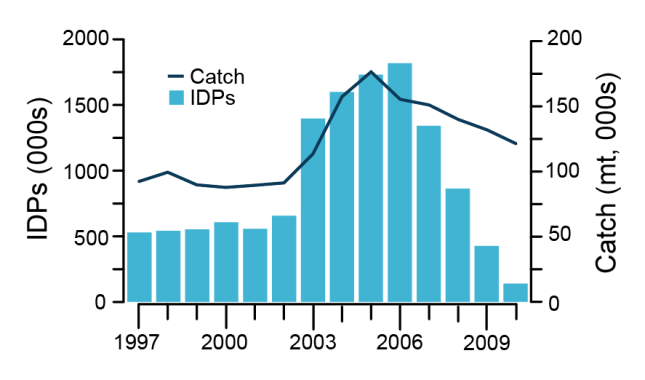 Figure 1: Number of internally displaced persons (000s) due to conflict in northern Uganda and Nile perch catch (mt, 000s), 1997–2010. The significant increase in internally displaced people resulting from Kony’s war in northern Uganda coincided in time with a jump in fish catch of Nile perch caught in Uganda. Source: Reprinted from Glaser et al. (2019) under Creative Commons License. Between 2007 and 2008, the ratio of fished to unfished biomass in the lake, measured respectively by catch and biomass, rose to 38 percent, a dramatic increase from the 23 percent for the period between 1999 and 2007. Around 2008 specifically, catch rose from 17 percent to 40 percent of total biomass. Fishers were capturing a much higher proportion of the fish available to them. This increased pressure on the fishery raised the stakes for control over Migingo—an island which was not inhabited before 1991. It was not until 2007 (the year after the peak in Ugandan IDPs) that the island became disputed. 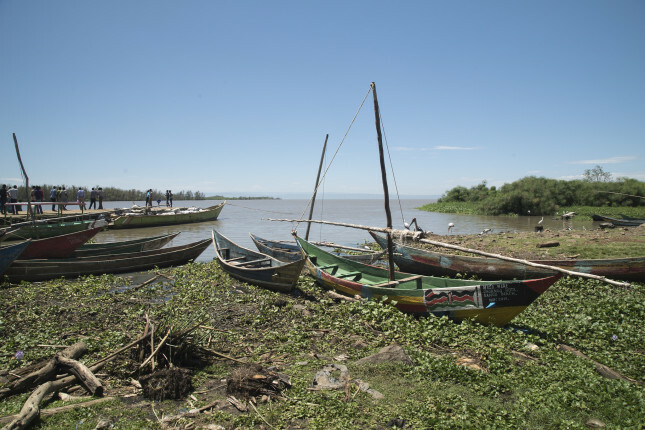 Beginning with the arrest of 16 fishers in September 2007, and continuing through 2008, reports that Ugandan authorities were harassing Kenyan fishers were prevalent. The conflict became most acute in 2009, a time corresponding to greater fishing pressure and decreased catches in Kenya and Uganda. In January 2009, the Kenyan prime minister called for the harassment to cease, and the next month, the island dispute appeared on the agenda at the East African Legislative Assembly (EALA) meeting in Rwanda. The East African Community (EAC) minister called the deployment of troops on the island an insult to the EAC Treaty, which established cooperative commercial and political relations between nations of east Africa in 2000. Eventually, tensions flared to the point where Rwandan President and then-East African Community Chairman Paul Kagame felt compelled to offer mediation and the Kenyan Parliament urged President Mwai Kibaki to seek intervention by the UN Security Council. 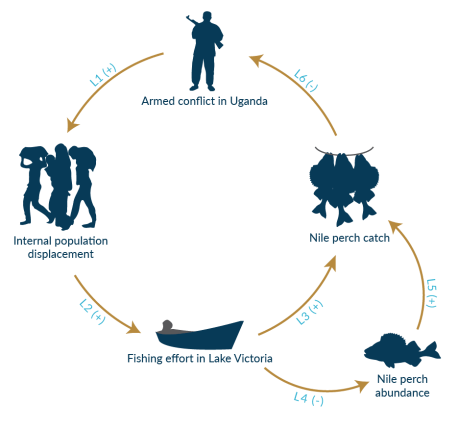 To recap, an armed conflict in Uganda’s north, which had nothing to do with fish, fueled fishing pressure along the lake (see Fig. 2). This fishing pressure led to increased competition for fish and dwindling stocks, and ultimately to conflict between Kenya and Uganda over fish. Figure 2: The complex and cyclic relationships between conflict and fisheries. The + and – signs show the direction of the relationship: a negative means when one factor goes up, the other goes down. That’s what makes coupled natural and human systems so interesting: The feedback loops are long and can take years to appear. And when they do, they may appear at different scales. In this case, a mostly domestic armed conflict increased competition over Nile perch among fisherfolk, which created tensions between Kenya and Uganda at the interstate level. These insights may generalize to other cases in which conflict is present and artisanal fisheries are a critical source of livelihood and food security. The critical factor is proximity of fighting to fishing areas. When fighting occurs far from fishing activities and communities, these activities and communities can become an attractive destination for displaced persons. These dynamics have been observed in Mozambique and Zimbabwe, the Democratic Republic of the Congo, and Vietnamese refugees in China. Alternately, when conflict occurs near or explicitly targets fishing areas, as in Liberia and the Jaffna peninsula of Sri Lanka, fishing effort may decline precipitously because of population displacement and, in some instances, active recruitment of fishers into rebel armies. Overall, our analysis helps identify scale- and location-dependent ways conflict affects natural resource utilization and management, and vice versa. Depending on where fighting occurs and where resources are located, conflict can either fuel unsustainable harvesting or create opportunities for harvested species to rebound. In either event, fisheries managers, especially in developing countries with artisanal fisheries, need to be cognizant of conflict dynamics in their efforts to support fisheries’ contributions to sustainable livelihoods and development. Cullen Hendrix is Director of the Sié Chéou-Kang Center for International Security and Diplomacy at the Josef Korbel School of International Studies at the University of Denver and Nonresident Senior Fellow at the Peterson Institute for International Economics. Sarah Glaser is Deputy Director of the Secure Fisheries program at the One Earth Future Foundation in Broomfield, Colorado. Sources: Al Jazeera, Aquatic Ecosystem Health & Management, Development Policy Review, Ecology and Society, Fish and Fisheries, Internal Displacement Monitoring Centre, Journal of Peace Research, Journal of Refugee Studies, Science, Secure Fisheries, Standard Digital, The East African.